Sometimes it’s best not to have pretensions about what you’re doing. The gang over at Polish developer Awesome Games Studio certainly seem to agree, with their amusingly-self-aware-titled Yet Another Zombie Defense HD making the jump to the Nintendo Switch. 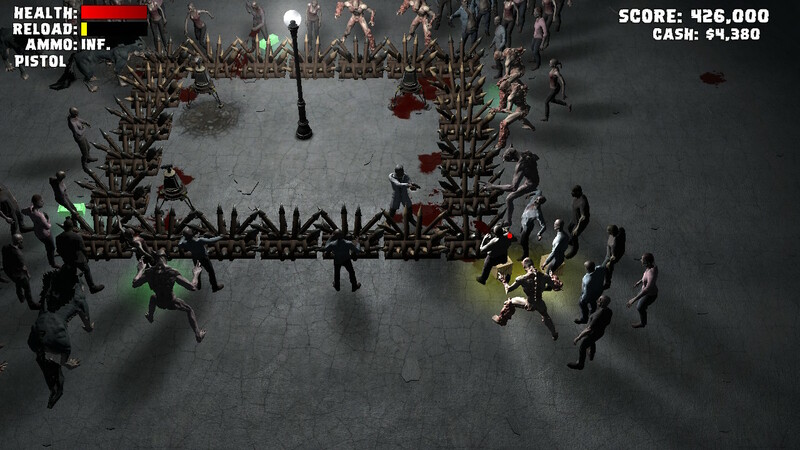 It’s an HD update of Yet Another Zombie Defense for X-Box Live Indie Games. The update adds multiplayer co-op and deathmatch modes to a fairly standard – but well-executed – twin stick shooter with some defense elements. Yet Another Zombie Defense HD plays like pretty much any other twin-stick shooter; you move around with the left stick, aim with the right stick, and fire with the triggers. The right trigger shoots your regular weapon, the left trigger tosses a grenade if you have any, and the L and R buttons cycle through your arsenal. The controls are simple, but they’re easy to understand and fit the frantic pace of the gameplay well. The zombie AI isn’t that smart; they just run in a straight line right at you. But, hey; that makes sense for zombies. Their brains are rotting and stuff. 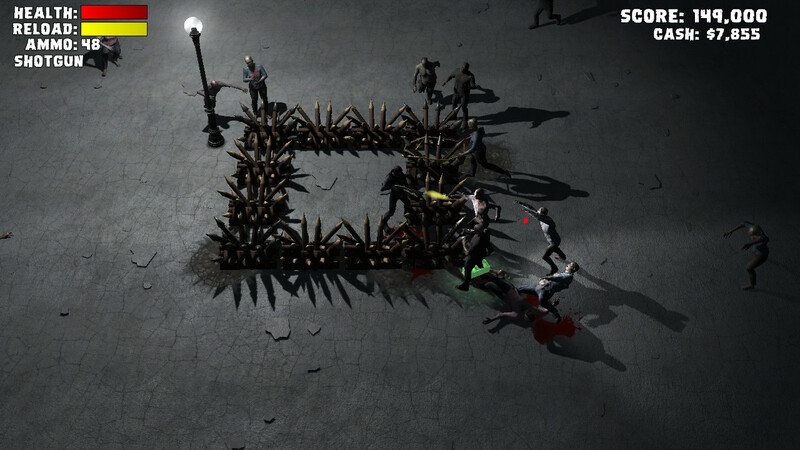 The main game mode, Defense, consists of a day/night cycle where you build defenses and buy supplies during the day and shoot up a horde of zombies at night. Defense-building strategy is a bit of a mixed bag. Early on it can be a good idea to fence yourself in, but as the nights drag on and your enemies get stronger, faster, and more numerous, you’re basically just building your own coffin if that’s all you do. You can build turrets and mount weapons on them for some fire support, as well as lay mines to blow up early waves. Playing co-op is especially fun, since the whole dang horde isn’t only chasing you. Divide and conquer! 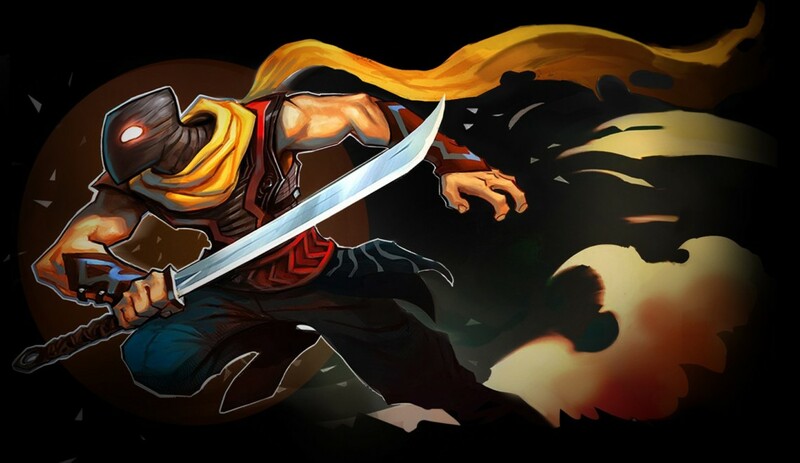 There are two other game modes, Endless and Deathmatch. 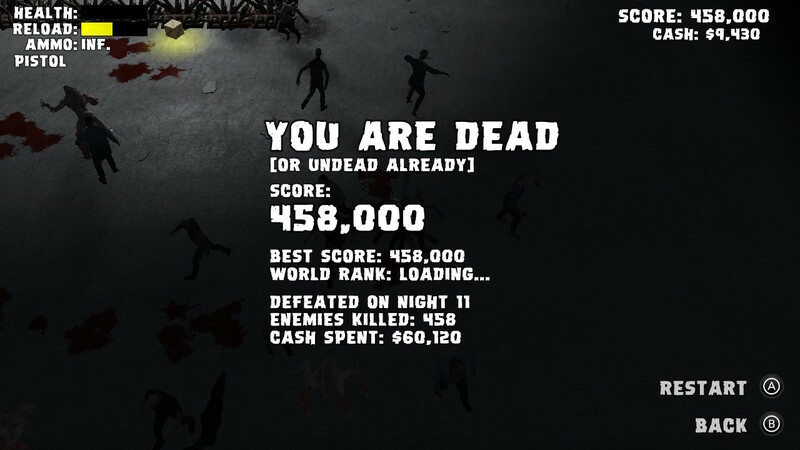 Endless is much like Defense in that waves of zombies come at you, except this time they do it endlessly. There is no day/night cycle and no building; you don’t buy new weapons, some zombies just drop them as you kill them. Deathmatch is the game’s versus mode. You try and defeat other players while hordes of zombies attack you both. It was my least favorite of the modes, but that may just be because it was the one where I died the fastest. I’m not that great at fighting things that don’t mindlessly follow one simple pattern, I guess. Not something I wanted to know about myself. 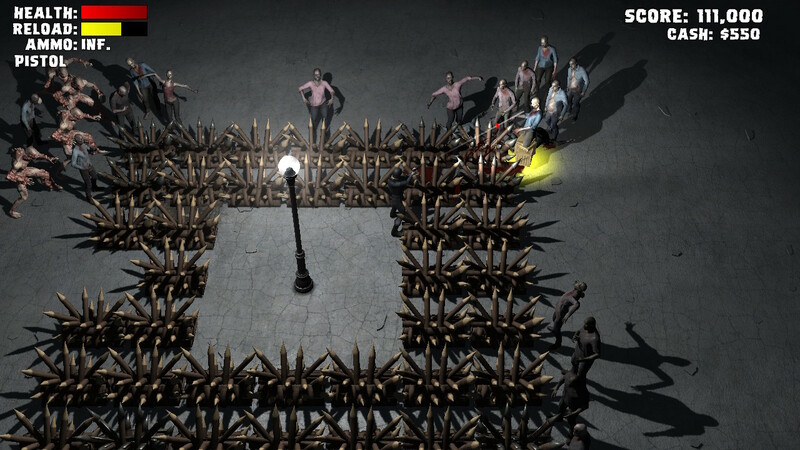 The game’s title suggests a clever, fun romp sending up the zombie survival genre. Instead, there’s no story or really any writing whatsoever. There are four characters to choose from, with the generic names of The Guy, The Girl, The SWAT, and The Doctor. The only real difference is the character models; they all play exactly the same. There’s no dialogue or one-liners or anything like that. 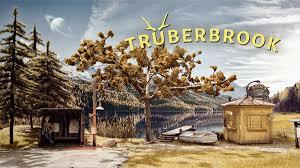 While the gameplay is pretty smoothly entertaining, I was a little disappointed that the ambition of the game’s writing didn’t extend beyond the title. The original Yet Another Zombie Defense is like ten years old now, so even with an HD update the graphics look a little dated. They aren’t bad in any way, they’re just not where top-level graphics are now. Everything is perfectly presentable, and considering how little light there is, most everything is shrouded in shadow and hard to see anyway. 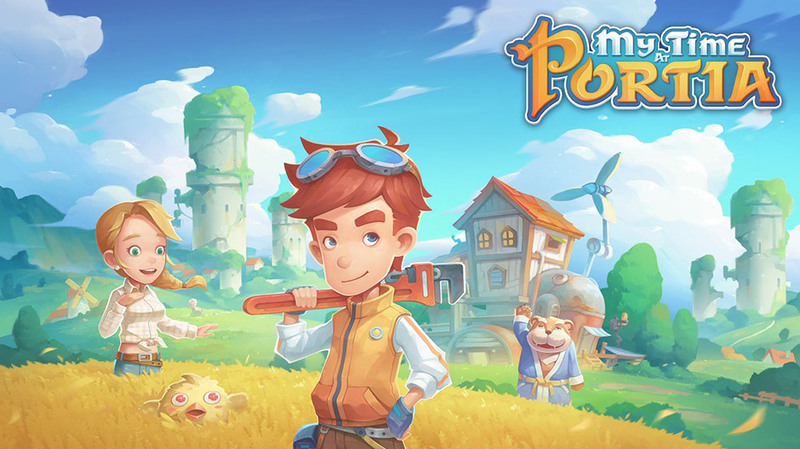 The biggest problem with the game’s graphics is the lack of variety in the setting. Every mode takes place on the same concrete slab with one street light in the middle. It gets a little boring to look at after a while. The music consists of some pretty dramatic, high-tension rock tracks during the fights and a more ponderous tune during the building phase of Defense mode. The music is really not that important to the experience, though; it is almost entirely drowned out by the sound of gunfire and wailing zombies. 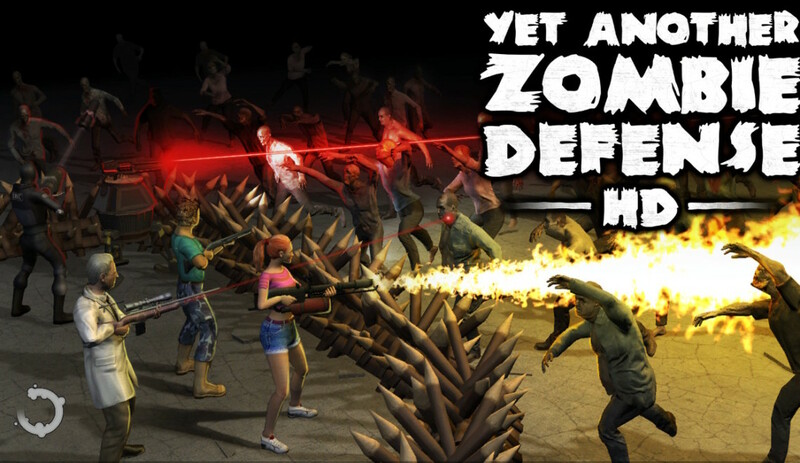 Yet Another Zombie Defense HD has no touch or motion controls, so you can play it docked or undocked as you prefer. Personally I preferred playing it undocked as that made the graphics look a little less dated; again, not that it looks bad, just a little last-gen. 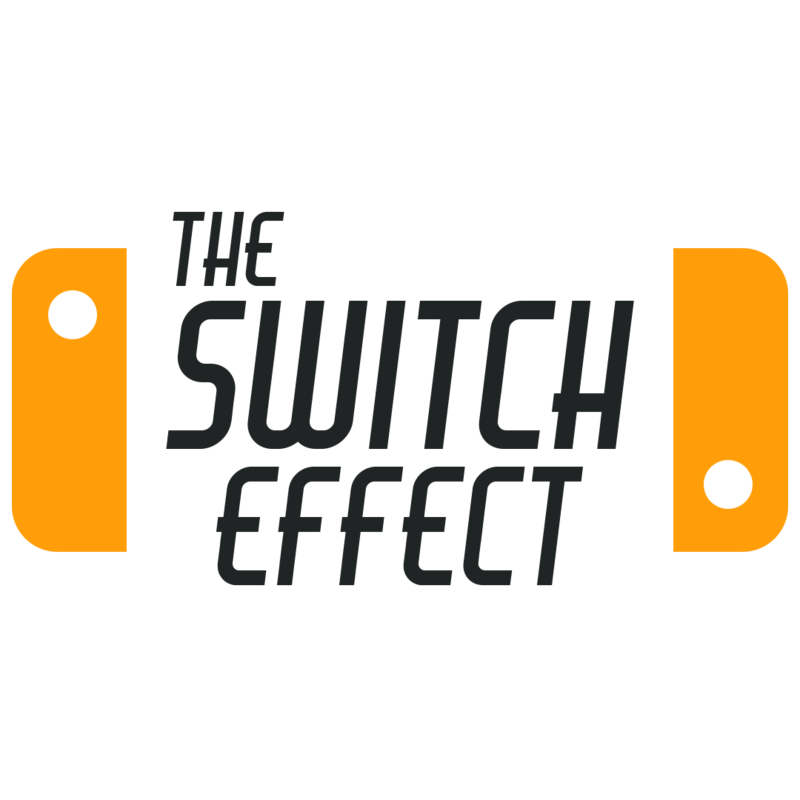 The simplicity of the control scheme made it easy to play whether I was using a Pro controller or attacked Joycons. TL;DR: Standard-issue twin stick shooter with well-executed gameplay.